Monarch butterflies have continued their resurgence in Rhode Island this year after a global decline in 2013, but overall populations of butterflies in the state appear to be declining slightly. As if to emphasize the point, the first day of a two-day, statewide butterfly survey sponsored by the Audubon Society of Rhode Island was nearly rained out this year, resulting in fewer surveyors spending fewer hours searching for and counting fewer butterflies. According to Jon Scoones, who coordinated the survey, 1,454 butterflies of 52 species were identified — a similar number of species but half of the individual totals of past years. Yet, there were still several notable highlights. Numbers of the tiny dun skipper, for instance, doubled compared to last year, while the even tinier sachem went from one in 2016 to 105 this year, almost all in Newport County. Monarchs, which Scoones said “everyone uses as a litmus test,” increased from 29 to 134, mostly in the West Bay. Butterfly enthusiasts around the state have posted numerous photos on social media of monarch eggs, caterpillars and adults in recent weeks, many with messages claiming to feel a sense of relief that the butterflies appear to have rebounded. On the other hand, survey results found the very common cabbage white to have declined from 638 to 243, and the popular pearl crescent dropped from 374 individuals to 78. Of particular note, Scoones said, is that the number of variegated fritillaries, a southern species found fairly rarely in the state, increased this year, especially in the Big River area. That may be the reason for increased sightings of other southern species as well, including zabulon skipper and red-banded hairstreak. Some southern species aren’t accustomed to the cold of southern New England, however, and they become scarce following severe winters, like occurred in 2013. But others appear able to survive. 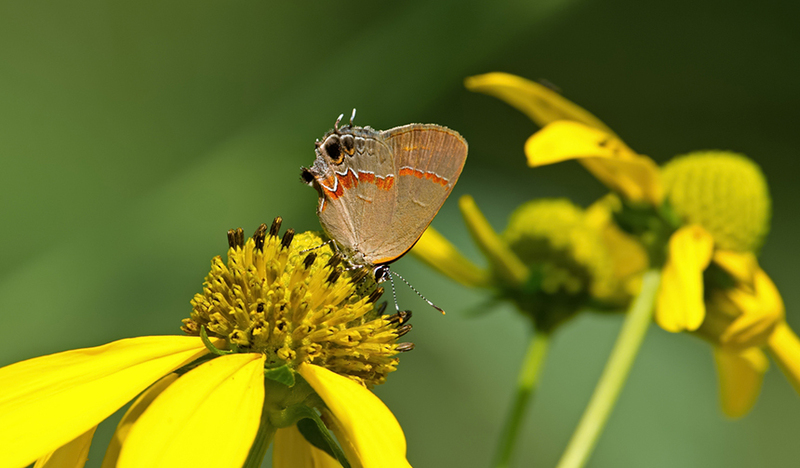 One thing Wencek and Scoones said that almost anyone can do to boost butterfly populations is to plant native flowers from which the adult insects can sip nectar, and plant the specific host plant that each species requires during its caterpillar stage. “It definitely works,” Wencek said. “I planted hops, and it brought in question marks. I put in pipevine and we got a pipevine swallowtail laying eggs. You want black swallowtail? Plant parsley. While butterfly numbers appear to fluctuate widely from year to year, Wencek has observed a slight decline in overall numbers in recent years. It is especially noticeable with the very common species, which he said are still common but he is noticing fewer of them. Looking to the future, he said Rhode Islanders should expect to see more and more butterfly species from the South making the Ocean State their summer home.